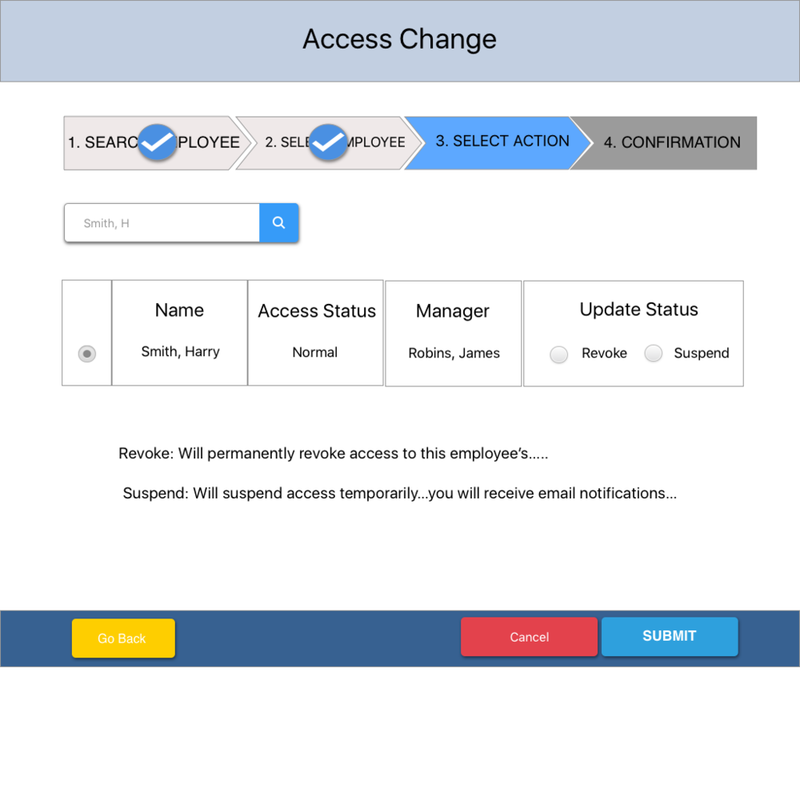 The Revoke Access project goal was to build an application that would allow Human Resource representatives and Managers across Comcast to remove an employee’s access to internal applications, email and building access. This was a brand new application to be designed for both desktop and mobile. My role was as the UX designer/researcher on this team conducting usability testing, QA defect testing, creating user flows, low-high fidelity wireframes, and prototypes. The project team included developers, a product owner (who also served as a Scrum Master) and functional team QA. Working with the product owner, I developed some initial screens based on the initial requirements. HR and Manager had different access points (IA). Other applications were going to be accessed through the application. 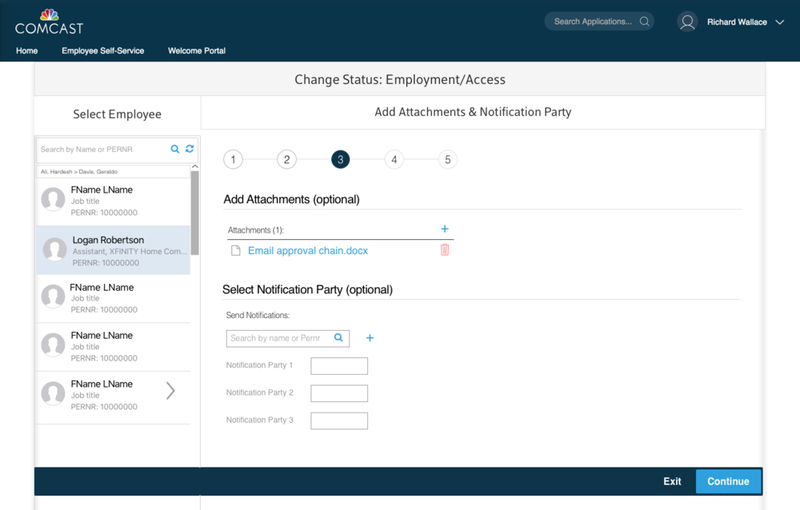 This came from the idea that eventually some e-forms (termination/severance) would move to this application. Mobile would not allow access to those e-forms. I created a flow for each scenario calling out the interactions in getting to, through the and if the user made a selection outside the application. You may have completed an investigation and now think the employee can be granted access again. Need to revoke someone same day or "emergency revoke"
Many of these changes could be attributed to working in Agile. The challenge was not the changing requirements as much as those changing requirements didn’t coincide with changing timelines. This put us behind in every sprint. Development said would be less work. Rather than combine all the actions I proposed separating it to minimize errors. The research shows this was the best option for various reasons. I created a prototype to represent both the more error prone process and my recommended experience. With the additional time investment needed and the belief (against the documentation) that it would not adversely affect the experience, the product owner chose to move forward with the lesser experience. Based on users, desktop was the project team’s priority. However, we needed to also allow for mobile usage, even if some features were not going to be available. This was the first time there was a focus on making an application truly responsive for mobile. Until this project, mobile was an afterthought. 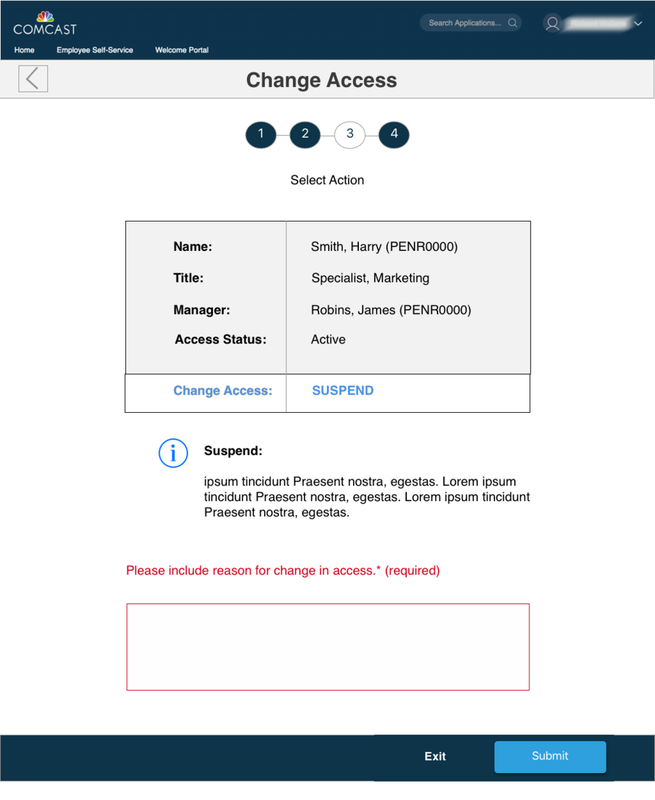 The framework, SAP Fiori, created some design challenges as it was not responsive but adaptive. Changes to desktop would make changes to mobile. For example, the mobile design to the right was not what I initially proposed. My initial mobile designs had the "Update Details" button below the input field. However, desktop was designing with the button on the same row and this could not be changed on mobile. Living within the constraints of changing requirements and designing for a lesser experience, I iterated through the process with my design colleagues and tried to simplify the experience as much as possible. I designed this interactive prototype for the development team to drive the build. For every project there are lessons learned and aspects that can be done better next time. Here are a few from this project. Overall, there was too much reliance on the product owners and what they believed worked for the user. More usability testing could have made this application more user centered and potentially minimized (or at least focused) the features. The product owner and senior advisors implemented a number of changing requirements throughout the project. Looking back, I would have been more involved with trying to talk through all the potential requirements early on and clearly explaining how delays would adversely affect outcomes. As the requirements changed, I realized that I would have gone a totally different way with my design. I pushed back to create the best experience consistently. Yes, I would have wanted a better experience for users and will subsequently battle for this and other applications we build to be more user centered. However, learning to compromise is a core piece to delivering a product. Push where you can; make incremental changes and live to fight for the user another day.